The Fall of Gondolin by J.R.R. Tolkien, edited by Christopher Tolkien and illustrated by Alan Lee, is finally being published as a standalone novel . 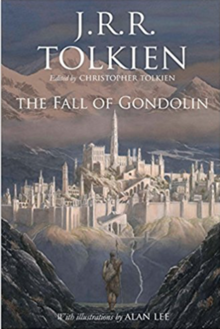 The Fall of Gondolin is one of Tolkien’s three Great Tales of the Elder Days of Middle Earth alongside The Children of Húrin and Beren and Lúthien. It concerns the rise and fall of a great Elven kingdom Gondolin and takes place millennia before the events of The Lord of the Rings. The earliest version of the Fall of Gondolin was probably written during J.R.R. Tolkien’s convalescence at Great Haywood, Staffordshire, in 1917. This is the only full account and belongs with ‘the Book of Lost Tales’. A compressed version of the story was also written between 1926 and 1930 in Line with a much edited ‘Silmarillion’. Then around 1951, Tolkien began work on another entirely refashioned account that comes to an abrupt end once Tuor reaches the hidden city of Gondolin. The Tale of The Fall of Gondolin takes place during the First Age of Middle Earth and concerns two of the greatest powers in Middle Earth; the evil god Morgoth who rules over a vast military power from his fortress of Angband and Ulmo, the Lord of Water, who is second in might only to Manwë, chief of the Valar. Ulmo is opposed to Morgoth/Melkor and works in secret in Middle-earth to support the Noldor Elves, including Húrin and Túrin Turambar, against the evil Morgoth/Melkor. It Features the hidden city of Gondolin, Which was built by Noldorin Elves after they rebelled against the Gods of Valinor and fled to Middle Earth. Gondolin is ruled by King Turgon who is hated and feared by all his enemies especially Morgoth, who seeks in vain to discover the marvellously hidden city. Meanwhile the gods in Valinor refuse to intervene in support of Ulmo’s desires and designs. Elsewhere Tuor, cousin of Túrin, sets out from his birthplace on a dangerous journey to the hidden Elven realm of Gondolin. He is guided by Ulmo, who actually appears to him at one point, during a storm. Having reached Gondolin, Tuor does many impressive deeds to help the Elves and achieves many great things; he is wedded to Idril, Turgon’s daughter. Unfortunately Morgoth learns the location of Gondolin through an act of supreme treachery by Maeglin and finds out all that he needs to mount a devastating attack on the city. So Morgoth besieges Gondolin with Balrogs and dragons and numberless Orcs. Tuor and Idril have a son Eärendel, and luckily Tuor and Idril, manage to escape the carnage with their child Eärendel, and flee southward. Along the way Tuor manages to save many of its inhabitants from destruction. and the refugees fled to a haven by the sea created by Tuor. Eärendil the Half-elven, The son of Tuor and Idril, eventually Marries Elwing, herself descended from Beren and Lúthien. Elwing brings Eärendil the Silmaril of Beren and Lúthien, and Eärendil uses it to travel across the sea to Aman to seek help from the Valar. Upon hearing what Morgoth has done The Valar decide to confront Morgoth, and his legions at Angband in an epic and cataclysmic battle. Later Eärendil and Elwing have two children: Elrond and Elros. As descendants of immortal elves and mortal men, they were given the choice of which lineage to belong to: Elrond chose to belong to the Elves, while his brother Elros became the first king of Numenor. The International Day against Nuclear Tests is observed annually on August 29. It was established on December 2, 2009 at the 64th session of the United Nations General Assembly by the resolution 64/35, which was adopted unanimously.The resolution in particular calls for increasing awareness “about the effects of nuclear weapon test explosions or any other nuclear explosions and the need for their cessation as one of the means of achieving the goal of a nuclear-weapon-free world”. The resolution was initiated by Kazakhstan together with several sponsors and cosponsors to commemorate the closure of the Semipalatinsk Nuclear Test Site on August 29, 1991. Following the establishment of the International Day against Nuclear Tests, in May 2010 all state parties to the Treaty on the Non-Proliferation of Nuclear Weapons committed themselves to “achieve the peace and security of a world without nuclear weapons”. On September 15, 2014 the Embassy of Kazakhstan in the United States in co-sponsorship with Arms Control Association, Green Cross International, the Embassy of Canada, and the ATOM Project held a conference “Nuclear Weapons Testing: History, Progress, Challenges” commemorating United Nations International Day Against Nuclear Tests. The conference took place at the U.S. Institute of Peace in Washington, D.C. This conference was focused on the issue of nuclear weapons testing and the road forward for the Comprehensive Nuclear-Test-Ban Treaty. The keynote presenters included the U.S. Secretary of Energy Ernest J. Moniz, the U.S. Under Secretary of State for Arms Control and International Security Rose E. Gottemoeller, the U.S. Under Secretary of Energy and NNSA Administrator Frank J. Klotz, and the Executive Secretary of CTBTO Lassina Zerbo. The participants of the conference underlined their commitment to the nuclear weapons non-proliferation. NationStates, a popular multiplayer government simulation browser game, celebrates the International Day against Nuclear Tests in a surprising way. On August 29th of every year, nations are granted the ability to use nuclear weapons against each other, leading to a violent multifaceted nuclear war. This tradition started after the mini-games initial appearance on the site for April Fools’ Day 2017, and subsequent user requests to make this a regular event. Wilder first became interested in acting at age 8, when his mother was diagnosed with rheumatic fever and the doctor told him to “try and make her laugh.”At the age of 11, he saw his sister, who was studying acting, performing onstage, and he was enthralled by the experience. He asked her teacher if he could become his student, The day after Wilder turned 13, he called the teacher, who accepted him; Wilder studied with him for two years. His mother Jeanne Silberman sent him to Black-Foxe, a military institute in Hollywood, where he was bullied and sexually assaulted, After an unsuccessful short stay at Black-Foxe, Wilder returned home and became increasingly involved with the local theatre community. At age 15, he performed for the first time in front of a paying audience, as Balthasar (Romeo’s manservant) in a production of Shakespeare’s Romeo and Juliet. Gene Wilder graduated from Washington High School in Milwaukee in 1951. Wilder then studied Communication and Theatre Arts at the University of Iowa, where he was a member of the Alpha Epsilon Pi Fraternity. Following his 1955 graduation from Iowa, he was accepted at the Bristol Old Vic Theatre School in Bristol, England. After six months of studying fencing, Wilder became the first freshman to win the All-School Fencing Championship. he returned to the U.S., living with his sister and her family in Queens. Wilder enrolled at the HB Studiolm Wilder was drafted into the Army on September 10, 1956. At the end of recruit training, he was assigned to the medical corps and sent to Fort Sam Houston for training. wanting to stay near New York City to attend acting classes at the HB Studio, he chose to serve as paramedic in the Department of Psychiatry and Neurology at Valley Forge Army Hospital, in Phoenixville, Pennsylvania. Sadly In November 1957, his mother died from ovarian cancer. Wilder also co-wrote the hilarious horror spoof Young Frankenstein in which he plays respected medical lecturer Dr. Frederick Frankenstein, the the Grandson of the scientist Victor von Frankenstein, who learns that he has inherited his infamous grandfather’s estate in Transylvania. Arriving at the castle, Dr. Frankenstein soon begins to recreate his grandfather’s experiments with the help of servants Igor (Marty Feldman), Inga (Teri Garr) and the fearsome Frau Blücher (Cloris Leachman). After he creates his own monster (Peter Boyle), new complications ensue with the arrival of the doctor’s fiancée, Elizabeth (Madeline Kahn). Young Frankenstein garnered an Academy Award nomination for Best Adapted Screenplay. Wilder also appeared in Willy Wonka in Willy Wonka & the Chocolate Factory (1971) The film tells the story of Charlie Bucket (Peter Ostrum) who wins a Golden Ticket found in a Wonka Chocolate bar enabling him to visit Willy Wonka’s chocolate factory with four other children from around the world who have also received Golden tickets, namely the obese Augustus Gloop, gum chewing Violet Beauragard, a bossy spoiled brat named Veruca Salt and the Television obsessed Mike Teevee. Wilder is also known for his four films with Richard Pryor: Silver Streak (1976), Stir Crazy (1980), See No Evil, Hear No Evil (1989), and Another You (1991). Wilder also directed and wrote several of his own films, including The Woman in Red (1984). The tragic death of his third wife actress Gilda Radner, from ovarian cancer also led to his active involvement in promoting cancer awareness and treatment, helping found the Gilda Radner Ovarian Cancer Detection Center in Los Angeles and co-founding Gilda’s Club. After 2003 Wilder turned his attention to writing. He produced a memoir in 2005, Kiss Me Like a Stranger: My Search for Love and Art; a collection of stories, What Is This Thing Called Love? (2010); and the novels My French Whore (2007), The Woman Who Wouldn’t (2008) and Something to Remember You By (2013). 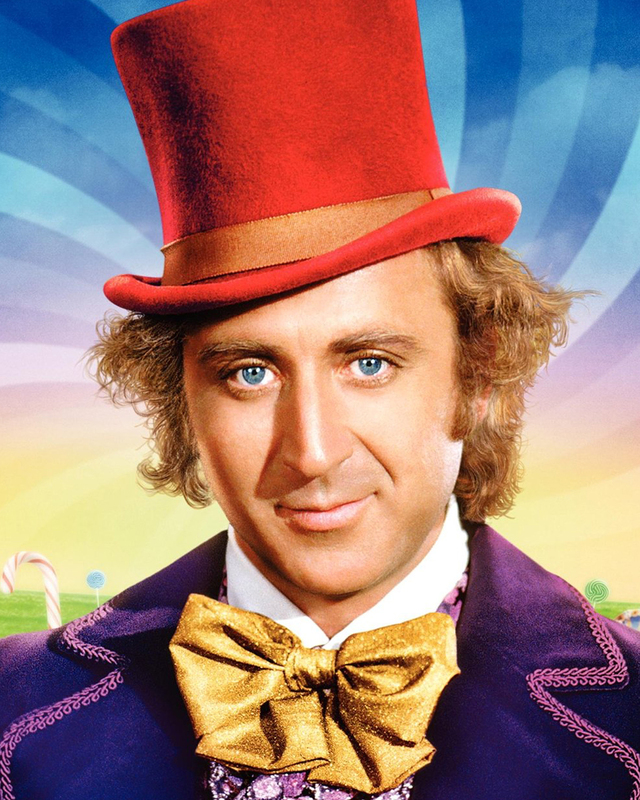 Gene wilder has left behind some truly memorable performances in many fantastic films. British naturalist ornithologist, conservationist, painter, naval officer sportsman. and explorer Sir Peter Scott CH, CBE, DSC and Bar, MID, FRS, FZS Sadly passed away on 29 August 1989. He was born in London 14th September 1909 , The only child of Antarctic explorer Robert Falcon Scott and sculptor Kathleen Bruce and was only two years old when his father died. Robert Scott, in a last letter to his wife, advised her to “make the boy interested in natural history if you can; it is better than games.” and his godfather was J. M. Barrie, creator of Peter Pan. He was educated at Oundle School and Trinity College, Cambridge, initially reading Natural Sciences but graduating in the History of Art in 1931. Like his mother, he displayed a strong artistic talent and had his first exhibition in London in 1933. His wealthy background allowed him to follow his interests in art, wildlife and many sports, including sailing and ice skating. He represented Great Britain and Northern Ireland at sailing in the 1936 Berlin Olympic Games, winning a bronze medal in the O-Jolle class dinghy. During World War II, Scott served in the Royal Navy, emulating his father. He served first in destroyers in the North Atlantic but later moved to commanding the First (and only) Squadron of Steam Gun Boats against German E-boats in the English Channel. He is also partly credited with designing ‘shadow camouflage’, which disguised the look of ship superstructure. He was awarded the Distinguished Service Cross for bravery. In 1948, he founded the organisation with which he was ever afterwards closely associated, the Severn Wildfowl Trust (now the Wildfowl and Wetlands Trust) with its headquarters at Slimbridge in Gloucestershire. In the years that followed, he led ornithological expeditions worldwide, and became a television personality, popularising the study of wildfowl and wetlands. His BBC natural history series, Look, ran from 1955 to 1981 and made him a household name. He wrote and illustrated several books on the subject, including his autobiography, The Eye of the Wind (1961). During his life he won many awards, In 1943, he was awarded the Distinguished Service Cross (DSC) “for skill and gallantry in action with enemy light forces”, and was appointed Member of the Order of the British Empire (MBE) in the 1942 King’s Birthday Honours. He was promoted to Commander of the Order of the British Empire (CBE) in the 1953 Coronation Honours. In the 1987 Queen’s Birthday Honours, he was appointed to the Order of the Companions of Honour (CH) “for services to conservation”.He was knighted by Queen Elizabeth II at Buckingham Palace in 1973 for his contribution to the conservation of wild animals. He had been a founder of the World Wildlife Fund, a founder of several wetlands bird sanctuaries in Britain, and an influence on international conservation. He received the WWF Gold Medal and the J. Paul Getty Prize for his work And he along with Sir David Attenborough inspired me, to take a great interest in nature and wildlife, which, I still find absolutely fascinating. British Motor Racing legend James Hunt was Born 29 August 1947, He began his racing career in touring car racing, Hunt progressed into Formula Three where he attracted the attention of the Hesketh Racing team and was soon taken under their wing. Hunt’s often action-packed exploits on track earned him the nickname “Hunt the Shunt”. Hunt entered Formula One in 1973, driving a March 731 entered by the Hesketh Racing team. He went on to win for Hesketh, driving their own Hesketh 308 car, in both World Championship and non-Championship races, before joining the McLaren team at the end of 1975. In his first year with McLaren, Hunt won the 1976 World Drivers’ Championship, and he remained with the team for a further two years, although with less success, before moving to the Wolf team in early 1979. Following a string of races in which he failed to finish, Hunt retired from driving halfway through the 1979 season. After retiring from racing in 1979, Hunt became a media commentator and businessman, commenting on Grands Prix for the BBC. He was known for his knowledge, insights, dry sense of humour and his criticism of drivers who, he believed, were not trying hard enough, which in the process brought him a whole new fanbase and He was inducted into the Motor Sport Hall of Fame on 29 January 2014. Sadly Hunt tragically died 15 June 1993 after suffering a heart attack. In the early 1990s they had several hit singles, including “Happy”, “Kill Your Television” and “Not Sleeping Around”. 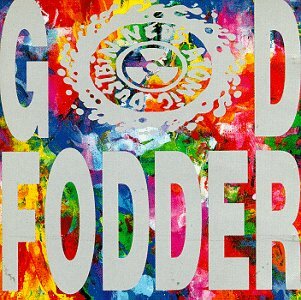 Together they released three successful albums (God Fodder, Are You Normal? and Brainbloodvolume).The Neds” (as their fans referred to them) were also well known for their own distinctive T-shirt designs, reportedly producing over 86 different designs within three years (1987–1990). Alex left when The band split up in 1995 after record company problems. However Penney formed a new band, Groundswell, initially with former Ned’s Atomic Dustbin guitarist Rat. The band released a few singles, and played some successful shows, but did not have much commercial success. After Groundswell split he completed a degree course, and now works as Media officer for Wolverhampton Civic Hall, while lecturing part-time and writing a weekly column titled ‘Up Penneyscope’ for local newspaper The Express & Star.In 2000 he reformed Ned’s Atomic Dustbin (with an altered line up including Andy King (bass) and Martin Warlow (guitar) for occasional gigs. The band completed a five date tour in 2004, and Penney continued to play occasional gigs with the band.Ned’s Atomic Dusbin reformed with original line-up for a re:united gig at the London Astoria in December 2008 and then a home gig in Wolverhampton. Penney recently contributed vocals to a song by Wolverhampton rock musician and free software advocate, Jono Bacon and still lives within walking distance of the Swan Hotel in Stourbridge. American motorsport driver and Land Speed Record Holder Gary Gabelich was born 29 August 1940. During the 1960’s Gary worked and drove a split window 1960 era VW kombi delivery van for Vermillion’s Drug store . He lived with his parents in the Bixby Knolls area of Long Beach, CA during this time. He later went to work for North American Aviation which became North American Rockwell after a 1967 merger with Rockwell-Standard. Gary started in the mail room and stayed for 9 years in various positions from staff assistant before becoming a part-time test subject for Project Apollo in the years 1968 & 1969. Gary served as an Apollo test astronaut in 1968-1969 as stated on the plaque his family dedicated to him in 2001. Gabelich broke the Land Speed Record by achieving average speeds of 622.407 mph (1,001.667 km/h) over a flying mile and 630.388 mph (1,014.511 km/h) over a flying kilometer on 23 October 1970. The thrust used during this attempt was between 13,000 pounds (5,900 kilograms) and 15,000 pounds (6,800 kilograms). A top speed of approximately 650 mph (1,050 km/h) was momentarily attained during one run. 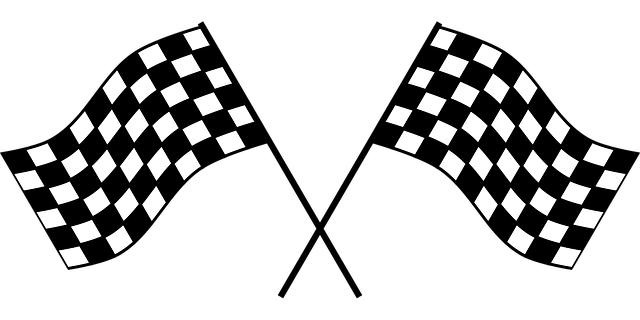 However The FIA rules dictate that a land speed mark is recognized only after two runs through the FIA measured kilometer and mile courses. The two corresponding speeds are then averaged for the official time and speed. Additionally both runs must be made within one hour. Gabelich averaged 629.412 mph (1,013 km/h) on his first run and 631.367 mph (1,016 km/h) on his second run for an average speed of 630.388 mph (1,015 km/h) establishing a new kilometer FIA LSR. The mile FIA LSR was the first exceeding 1,000 km/h (621 mph) and remained unbeaten until 1983, when Richard Noble broke it driving Thrust 2. The faster kilometer FIA LSR remained unbroken for 27 years until ThrustSSC went supersonic in 1997. In 1969 Gabelich established a quarter mile Drag boat record of 200.44 mph (323 km/h) This is not the same as the Union Internationale Motonautique (UIM) Water Speed Record (WSR) in which Donald Campbell broke 200 mph (322 km/h) on 23 July 1955 in the Bluebird K7. Sadly Gabelich was seriously injured in the crash of an experimental 4 wheel drive Funny Car in 1972 that careered out of control at 180 mph (290 km/h) during a quarter mile run almost severing his left forearm and broke his left leg so severely that more than a year later he still wore a cast. This incident ended his racing career and he never raced again, concentrating instead on a new supersonic vehicle. In the early 1980s he established the “Rocketman Corporation” with Tom Daniel. The objective was to design and build a vehicle capable of reaching speeds in the 800 mph (1,287 km/h) range. This conceptual vehicle was named “American Way” but the project was cut short by his untimely death in January 1984 in a motorcycle crash.Gary Gabelich was part of the cast in the 1977 movie “Joyride to nowhere” and he made a documentary,”One Second from Eternity: The History of the Land Speed Record” in 1971. Gary and his family appeared on the Family Feud with Richard Dawson, where he presented the key to the city of Long Beach, California. to Mr Dawson. In 2008 Gary was inducted into the Long Beach Motorsports Walk of Fame in front of the Convention Center on Pine Avenue. He was represented at the ceremony by his wife Rae, a Long Beach City Councilwoman who retired in 2012 after 8 years service. On 23 October 1970 Gary Gabelich set the Fédération Internationale de l’Automobile (FIA) Land Speed Record (LSR) with the rocket car Blue Flame on October 23, 1970, on a dry lake bed at Bonneville Salt Flats near Wendover, Utah. 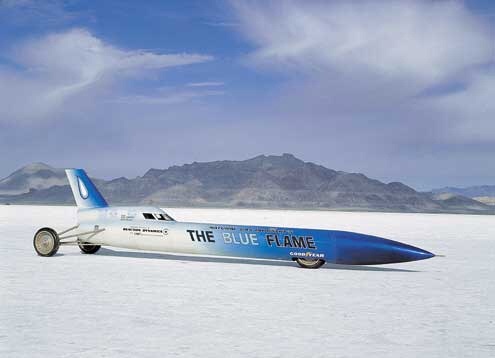 Blue Flame, was fueled with natural gas and when driven by Gary Gabelich it achieved the world land speed record on Bonneville Salt Flats in Utah on October 23, 1970. The vehicle set the FIA world record for the flying mile at 622.407 mph (1,001.667 km/h) and the flying kilometer at 630.388 mph (1,014.511 km/h).